MVL Mobiles announced their first ultra slim touch screen phone – SIZERO. It is a Slim Touch Phone with good quality video playback and recording. Specially designed for the youth, one will love to capture and share images and videos with MVL SIZERO. 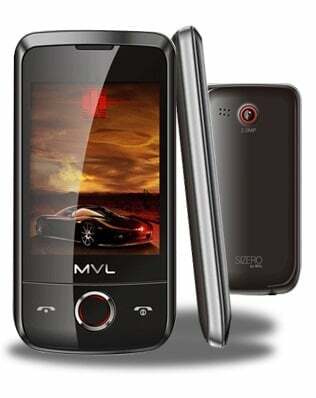 MVL SIZERO is slim and sleek touch screen phone with display size of screen 2.8 inches. Get 2GB memory card with SIZERO which is preloaded with multimedia content of latest MP3 songs, videos and wallpapers. Other main features of SIZERO are 3.5mm Music Jack, 2.0 MP camera, Dual Sim and videoplayback and recording. Accessories that comes with this phone – 2GB memory card (preloaded multimedia content consisting of 40 High Resolution Videos and 15 Mp3 songs), sylus string, charger, data cable, eartphone and leather pouch. Basic phone like samsung corby.